Ebooks are the new books. At least that's according to a recent survey by the Library Journal that looked at American public libraries. 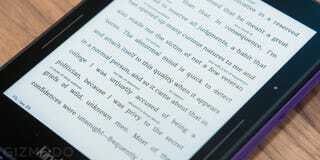 Ninety-five percent of libraries carry ebook titles. That's up from 89 percent in both 2013 and 2012, when researchers thought that adoption had plateaued for good. The latest stats come from the fifth annual Ebook Usage in Public Libraries survey which has seen remarkable growth in ebook lending in the last five years. Not only is the number of libraries lending out ebooks increasing, but their selection is expanding as well. The average number of ebooks carried was 20,244 by each library, but that of course was skewed toward large libraries. The median number made available was 10,434 titles. Those remaining 5 percent of libraries that don't have ebooks? The vast majority cite a lack of money to acquire them. But last year San Antonio introduced the first library completely devoid of paper books. And it's not hard to imagine a world where that will become increasingly common.